Lewis Carroll. Charles L. Dodgson (Lewis Carroll), photograph. The Library of Congress. Few writers of fantasy have managed to permeate their own cultures as did Charles Lutwidge Dodgson, a mathematician and amateur photographer who wrote children’s books under the pseudonym Lewis Carroll. Like other memorable characters who have taken on lives beyond their fictional sources, such Carroll creations as the Mad Hatter, the Red Queen, and the Cheshire Cat are known even to those who have never read his work. Among those with an enduring love of Carroll’s work was Walt Disney, whose 1951 animated adaptation of Alice’s Adventures in Wonderland has been perhaps even more successful at sharing Carroll’s unique ideas with modern audiences than the author’s own books. An Excellent but Unhappy Student. The man known best as Lewis Carroll was born Charles Lutwidge Dodgson on January 27, 1832, in Daresbury, Cheshire, the oldest son of the Reverend Charles Dodgson and Frances Jane Lutwidge Dodgson. He was the third of eleven children, and his ability to entertain children likely began with his younger siblings, for whom he invented games. In his early childhood Dodgson was educated at home. His father became rector at another parish in 1843, prompting the family’s move to Croft in Yorkshire. The following year Dodgson began attending Richmond Grammar School, and in 1846 he started studies at Rugby. He was a good student but was unhappy in the public school environment. In 1850, the year of his mother’s death, he entered Christ Church, Oxford University, where he earned first-class honors in mathematics and second-class honors in classics before graduating in 1854. In the middle of his college studies he had been granted a Studentship, a research internship; it would provide a lifelong living, but to keep it Dodgson was required to take holy orders and remain celibate—neither of which he apparently found difficult. Entrance into Academia and Religious Life. In 1855 Dodgson was appointed a fellow at Christ Church and began lecturing on mathematics, the start of a long and fairly uneventful academic life. He completed his master’s degree in 1857, and in 1861 he was ordained a deacon of the Church of England, making him officially the Reverend Charles Lutwidge Dodgson. His stammer may have determined his decision not to follow his father into the next step; there were likely other personal reasons as well, such as his love of the theater. Still, occasionally Dodgson was called upon to officiate at religious ceremonies such as baptisms and funerals. A Lifelong Bachelor. A lifelong bachelor, Dodgson devoted his time not spent in academic pursuits to reading, writing, and taking photographs, a hobby he took up starting in 1856. He admired many contemporary writers of the day, including Alfred, Lord Tennyson and William Makepeace Thackeray, and he often persuaded writers to be photographed. Dodgson also befriended young girls in the Oxford community, frequently making them the subjects of his photographs. He was at ease with children, joking with them and entertaining them with stories, songs, puzzles, and games. The same could not be said for Dodgson as a lecturer: His students routinely found him clear and knowledgeable, but dry if not boring. Certainly the titles of his early mathematical publications give no indication of Dodgson’s wit. It is perhaps not surprising that Dodgson went on to create the Alice books during an era of invention and expansion. As the British Empire continued expanding under the rule of Queen Victoria, scientific inventions like the lightbulb, telephone, and automobile were making their way into the commercial markets. The Alice Books. The origins of Carroll’s Alice books are well known. Dodgson was particularly interested in a girl named Alice Liddell, who was nine years old when he began telling her and her sisters a fantastic story during a boat trip and picnic with Robinson Duckworth, a canon, on July 4, 1862. The children begged him to write down the extemporaneous story, and this served as the basis for his two books about the fictional Alice. Dodgson completed the manuscript of his first novel, which he had titled Alice’s Adventures Under Ground in 1864; at the urging of his friend George MacDonald’s children, it was published the following year as Alice’s Adventures in Wonderland. Though many others have illustrated the Alice books, the best-known illustrations are those by John Tenniel, which appeared in their original publications. Meeting Queen Victoria. 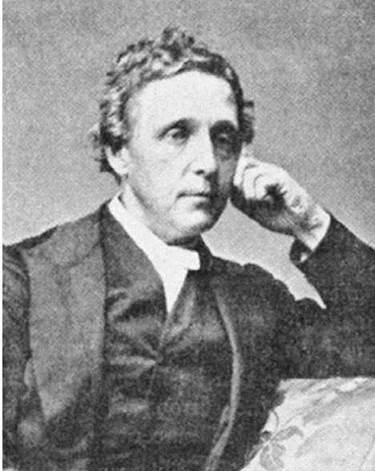 Dodgson was a quiet, religious man, always somewhat embarrassed by his fame as Lewis Carroll (even to the point of returning any mail addressed to him under that name), but he had a rich sense of humor, as shown not only in his writings but also in a story related to Alice’s Adventures in Wonderland. After its publication he was invited to meet Queen Victoria, who exclaimed over the book and asked Dodgson to send her his next effort. This he dutifully did, and the queen received an inscribed copy of a book on mathematical determinants. Needless to say, she was not amused. In 1869 Dodgson published another book as Lewis Carroll, Phantasmagoria and Other Poems. It was not as successful, though, as either Alice’s Adventures in Wonderland or his next Lewis Carroll book, Through the Looking-Glass, and What Alice Found There, which, like Alice’s Adventures in Wonderland was both incredibly popular and critically acclaimed. Another Carroll work, The Hunting of the Snark: An Agony in Eight Fits, was published in 1876. Like the Alice books, it relies heavily on interesting characters and situations and on the use of nonsense. In this long comic poem, ten figures in search of adventure hunt for a beast called a Snark. The seeming silliness of it all is part of the appeal, as is Carroll’s wit. Lectureship Resignation Leaves More Time to Write. In the 1880s Dodgson became increasingly more private. In 1880 he abandoned photography, and the following year, at age forty-nine, he resigned his lectureship in mathematics to devote himself to his studies and his writing. Although he supported his six unmarried sisters and helped to pay for relatives’ education, he did not need much money himself (in fact, in 1880 he had requested that his salary be lowered since he was not teaching that much), and he apparently did not enjoy lecturing. However, he then accepted an appointment as curator of the Senior Common Room at Christ Church in 1882, a position he resigned ten years later. Dodgson’s other extended effort as Lewis Carroll appeared as two related books, Sylvie and Bruno (1889) and Sylvie and Bruno Concluded (1893). Readers and critics generally find these works less appealing than the Alice books and The Hunting of the Snark, probably because they are more deliberately moralistic than Carroll’s earlier fantasies. While the early books had avoided the Victorian tendency to use children’s literature primarily to teach values, the Sylvie and Bruno books are hurt by this tendency. In these books he uses fantasy—here the elements of fairy romance—not for their own sake but for allegorical purposes. Death and Publication of an Illustrated Manuscript. Dodgson died on January 14, 1898, of a bronchial infection while visiting some of his sisters in Guildford, Surrey. That same year Alice Liddell Hargreaves, once the girl who inspired the Alice books and to whom Dodgson had given his illustrated manuscript ‘‘Alice’s Adventures Under Ground’’ in 1864, had the manuscript auctioned for 15,400 pounds. At the time it was the highest price ever paid for a book in an auction in Britain. Sully Prudhomme (1839-1907): Winner of the first Nobel Prize in Literature in 1901, this French poet and essayist is best-known for his idealism and ability to synthesize themes from both the sciences and the arts. Edward Lear (1812-1888): British nonsense writer who made the limerick popular. William Butler Yeats (1865-1939): A key figure in the Irish Literary Revival and cofounder of the Abbey Theatre, this Irish dramatist and author remains one of the most significant literary figures of the twentieth century. Queen Victoria (1819-1901): Queen of England for sixty-three years, a period known as the Victorian era, she was partly responsible for the success of the Industrial Revolution and is known for her role in the expansion of the British Empire. George MacDonald (1824-1905): Scottish pastor and author of popular fairy tales, such as The Princess and the Goblin. Rudyard Kipling (1865-1936): One of the most popular authors of his day, this English writer is highly regarded for his contributions to the short story and children's literature genres; for this Kipling was awarded the Nobel Prize in Literature in 1907. A clergyman, mathematician, and logician, Carroll is one of the foremost writers of fantasy in literary history. Carroll was encouraged to publish by his mentor George MacDonald, a Scottish author who also wrote fairy tales and fantasy novels. Prior to publishing, Carroll’s social circle included a number of influential artists including John Ruskin, Dante Gabriel Rossetti, William Holman Hunt, John Everett Millais, and Arthur Hughes. Lauded as a genius who fused his eccentric personal characteristics and opinions with a genuine love of children and childhood, he helped liberate juvenile literature from its history of didacticism and overt moralizing. The Alice books have a value beyond their appeal to children. They have also been interpreted as political satire and are highly esteemed as sophisticated treatises on mathematics and logic. The Fantastic. Several qualities of Alice’s Adventures in Wonderland and Through the Looking-Glass have contributed to their longevity. First is the books’s success as fantasy: Through Carroll’s prodigious imagination his fantastic worlds come to life, vibrantly filled as they are with bizarre places, people, and happenings, all seen through the experience of a girl who is sensible enough to find these things silly or scary but who is young enough to take pretty much everything in stride. Linguistic Playfulness. Supporting the fantasy is Carroll’s playfulness with language. Second only to Edward Lear in the creation of nonsense words and verse, in his Alice books and elsewhere Carroll manages to incorporate many delightfully nonsensical words into his stories. This succeeds in large part because, as Humpty Dumpty points out to Alice in his explication of the poem ‘‘Jabberwocky,’’ the words do make sense in a sort of distorted logic. Carroll’s frequently twisted games with logic in the books are yet another reason why readers, young and old, have enjoyed Carroll’s tales about Alice for more than a century. Alice Lives On. Since their publication, elements from Alice’s Adventures in Wonderland and Through the Looking-Glass and What Alice Found There have made their way into popular culture and influenced works in a variety of artistic media. While so-called ‘‘Alice imitations’’ were most popular at the end of the nineteenth and beginning of the twentieth centuries, works like Maeve Kelly’s Alice in Thunderland (1993) and Alison Haben’s Dreamhouse (1995) continue to be published. One of the most notable things in the Alice books is the hallucinatory quality of the characters and plot, due to Alice's dreaming. The use of dream sequences as a plot device is common in most surreal literature; here are a few other works that may—or may not—be based simply on a dream. Finnegans Wake (1939), a novel by James Joyce. In this notoriously difficult novel, plots and characters often change for no reason, and the title character is usually either dead or dreaming. The Wizard of Oz (1939), a film directed by Victor Fleming. In this classic based upon L. Frank Baum's Oz books, farm girl Dorothy gets swept up in a tornado and lands in a magical land—or is she really just asleep back in Kansas? The Mad Hatter (1978), an album by Chick Corea. Based specifically on the Alice books, this jazz fusion album features songs titled after Alice's dream and often sounds dreamy and discordant. Early reviews of the Alice books concentrated on Carroll’s magnificent invention and his skill as a linguist, parodist, and literary stylist. After his death, critics analyzed the stories from many points of view—political, philosophical, metaphysical, and psychoanalytic—often evaluating the tales as products of Carroll’s neuroses and as reactions to Victorian culture. Because of the nightmarish qualities of Alice’s adventures and their violent, even sadistic, elements, a few commentators have suggested that the Alice books are inappropriate for children; as a result, the stories are not always enjoyed by the audience for whom they were apparently intended. However, Carroll is consistently applauded as one of the world’s foremost writers of nonsense, an author who successfully combined the logical with the illogical in two timeless novels that have fascinated children and adults alike. 1. Read one of Carroll’s ‘‘nonsense’’ poems such as ‘‘Jabberwocky’’ or The Hunting of the Snark. Why are they considered nonsensical? In what ways do they, as Carroll asserted, display their own sort of logic and pattern? 2. How does Dodgson’s knowledge of mathematics come into play in the Alice books? Find specific examples of logic or mathematical principles. 3. One notable characteristic of Carroll’s Alice books is their focus on the rules of acceptable behavior in confusing and nonsensical worlds. One notable example is the tea party with the Mad Hatter. Find additional examples of this theme in either book. How do you think this reflects the rules of the Victorian society in which Carroll lived? How might these works be seen as a parallel to a child’s learning the rules of the adult world? 4. Carroll first used his famous pen name on a poem written for adults and published in 1856. Why do you think Carroll used a pen name for many of his works? How does his pen name reflect his fondness for wordplay? Auden, W. H., ‘‘Lewis Carroll.’’ In Forewords and Afterwords, ed. Edward Mendelson. New York: Random House, 1973, pp. 283-93. Blake, Kathleen, Play, Games, and Sport: The Literary Works of Lewis Carroll. Ithaca, N.Y.: Cornell University Press, 1974. Bloom, Harold, ed., Lewis Carroll: Modern Critical Views. New York and Philadelphia: Chelsea House, 1987. Cohen, Morton N., Lewis Carroll: A Biography. New York: Random House, 1995. Green, Roger Lancelyn, Lewis Carroll. London: Bodley Head, 1960. Jones, Jo Elwyn, and J. Francis Gladstone, The Red King’s Dream. London: Jonathan Cape, 1995. Lennon, Florence Becker, Victoria Through the Looking-Glass: The Life of Lewis Carroll. New York: Simon & Schuster, 1945. Prickett, Stephen, ‘‘Consensus and Nonsense: Lear and Carroll.’’ In Victorian Fantasy. Bloomington: Indiana University Press, 1979, pp. 114-49. Rackin, Donald, ed., Alice’s Adventures in Wonderland: A Critical Handbook. Belmont, Calif.: Wadsworth, 1961. Weis, Margaret, ed., Fantastic Alice. New York: Ace Books, 1995.